IFA Berlin 2014 is set to kick off on September 5th, 2014. Europe’s most highly anticipated tech convention will feature smartphones of several companies including the Asian Manufacturers Sony. As the date of their event comes closer, Sony released another teaser image and it uncovers a major feature of the upcoming devices. The image above shows an arrow under water with 2 meters written below it. 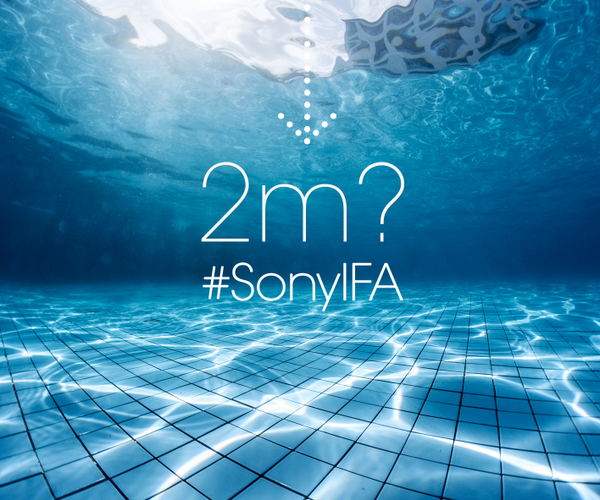 The clearly depicts that the upcoming Sony device will be water-resistant till 2 meters of water depth. Previously, it was Sony’s Xperia M2 Aqua that had that maximum depth capability of 1.5 m. So the trend will continue with the next Sony flagship set to have IP68 certification which allows for maximum 3 meter depth (but the manufacturer decides the device limit). These limits are quite average but actual devices have gone much deeper and survived. Recently a Sony Xperia Z2 survived depths of 6 meters for 6 weeks and lived to tell the tale (except a broken back glass). Is water-resistant feature essential for you?